Rising interest rates, falling home sales, and talk of a recession in 2019: what does it all mean if you’re buying a home, selling, or just sitting tight? We created this guide to help anyone who isn’t an expert or a psychic understand today’s housing market trends. The 2019 housing market: if it’s not another crash, then what can we expect? Anxious about the real estate market? Opendoor can help. Already familiar with trends in economic growth, interest rates, and affordability? Jump ahead to the housing market in 2019. We’re seeing one of the longest periods of economic growth in US history. When the housing market crashed in 2008, it led to one of the worst economic periods since the Great Depression, often called the Great Recession. The economy has not just recovered from this period, but grown steadily each year since the crash. Over a decade after the Great Recession, unemployment is the lowest it’s been in 50 years, wages are rising at a faster rate, and consumers continue to spend more, which fuels the economy. 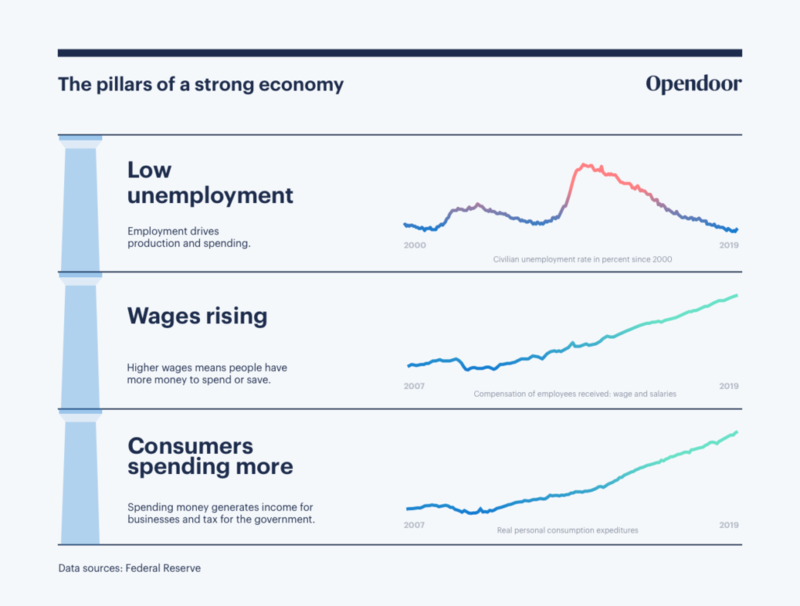 Think of these trends as pillars that support economic growth: the more people who have jobs, higher wages, and money to spend, the stronger the foundation of the economy. As the economy grew, home prices rose rapidly across the country. In the last few years especially, the low unemployment rate combined with low costs of financing a home meant more people could afford a home; demand increased. At the same time, the number of homes for sale reached the lowest in decades, in part because fewer homes were being built and because many homeowners had financial incentives not to sell; supply stayed low. Home prices increased as more buyers competed for fewer homes. What happens when more people want to buy homes than there are homes for sale? Home prices increased as more buyers competed for fewer homes. The Fed increased rates to prevent the economy from growing too fast. As the economy recovered from the Great Recession, prices for goods and services began to rise, known as inflation. This is normal, but if inflation happens too fast, it can spiral out of control. One of the ways the Fed can control inflation is by adjusting the federal funds rate. If you’ve heard about “rising rates” in the news; this is what those headlines are referring to. Rising interest rates impact the ability to afford a home. What is the Fed aka Federal Reserve? The “Fed”, short for Federal Reserve, is like our nation’s bank for banks, but it’s also kind of like a pilot for the economy. It’s job is to maximize employment and stabilize prices, all with the goal of keeping the economy growing at a steady pace. One of the ways it can control inflation is by raising or lowering the federal funds rate. What is the federal funds rate and why does it matter? The federal funds rate is the interest rate that banks use to lend money to each other, and that cost gets passed to consumers when they pay interest on a loan. The Fed doesn’t set “the interest rate you pay”, it influences the price for banks to loan money to you. When the fed funds rate goes up, it causes short-term interest rates, like what you pay on a credit card, to increase. People then spend less and save more which slows inflation. Why does the Fed raise or lower the federal funds rate? Typically, when the Fed is less confident about the health of the economy, rates go down. It then becomes cheaper for banks to loan money so people borrow more and spend more. In 2008, the Fed slashed rates to virtually zero. When the Fed is confident about the health of the economy, it tends to raise rates to slow inflation. Following strong job growth in 2018, the Fed increased rates each quarter. How does the federal funds rate impact long-term interest rates like a mortgage? The federal funds rate does not directly impact long-term interest rates like a 30-year, fixed rate mortgage. Just because the fed funds rate increases, does not mean the cost of a mortgage will do the same. Long-term rates are influenced by Department of the Treasury yields, investor sentiment, and inflation rates, among many other factors. Learn more in our blog on interest rates and home ownership. The fed funds rate does not directly impact long-term rates. Just because it increases, doesn’t mean mortgage rates will do the same. It would say, “Prices for all goods and services are rising too fast, let’s raise the fed funds rate to slow inflation.” As a natural consequence, buying a home could then become less affordable. This scenario is similar to what’s happening today. Rising rates have made homes less affordable. Short-term interest rates impact your budget. If you deposit money in a savings account, a rise in short-term rates does increase the interest on your savings. However, savings rates tend to be much lower than the interest you pay on short-term debt, roughly 1% vs 15% respectively. If you’re paying higher interest on your credit card, then you have less room in your budget to spend on the things you want like new clothes, a new car, or a house. 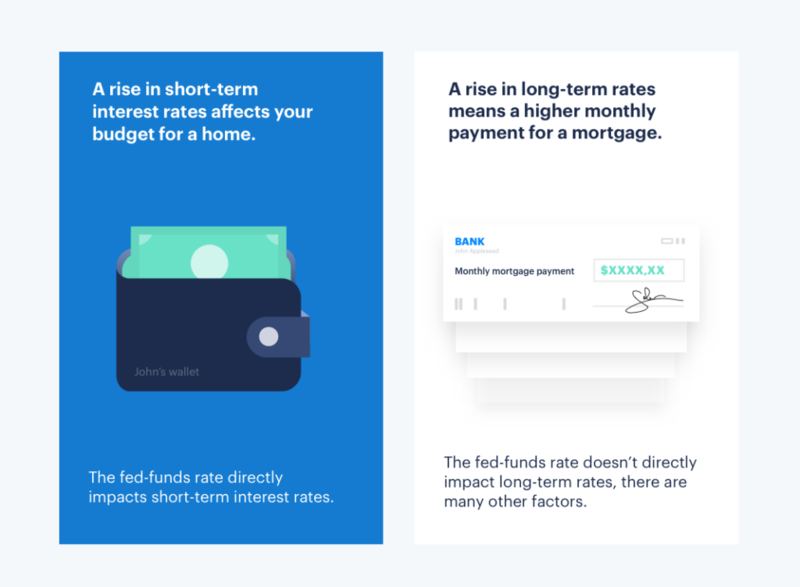 Over the past few years, the Fed has steadily increased short-term interest rates, which can lead people to have a tighter budget for a home at a time when home prices are rising. Long-term interest rates impact your mortgage payment. A 1% increase in the mortgage rate means you’d pay almost 10% more per month. Source: Opendoor mortgage calculator; Assumes 20% down; $75 for insurance; and $210 for property tax. Today, the combination of rising interest rates and rising home prices has outgrown what many Americans can afford. So how expensive are homes? We can measure housing affordability on a scale from 0 (most affordable) to 10 (least affordable). 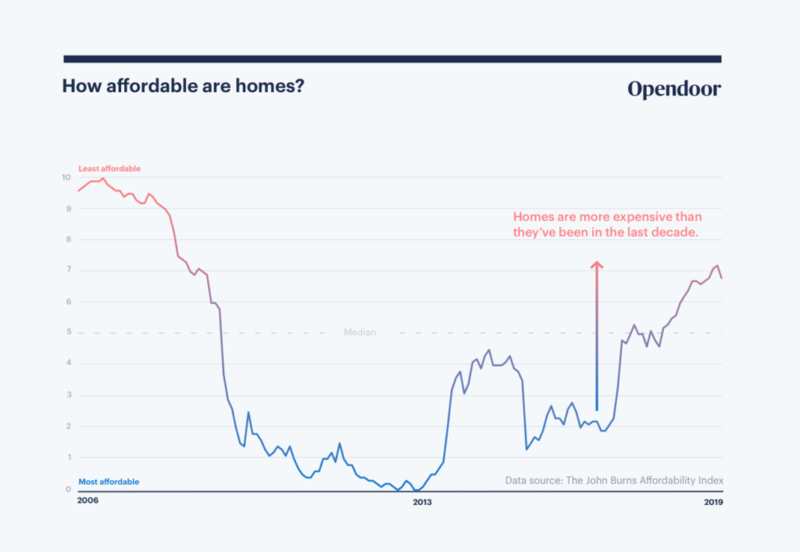 The John Burns Affordability Index calculates the relationship between median incomes and housing costs such as the mortgage, taxes, insurance, and mortgage insurance assuming the purchase of a home valued at 80% of the market median. As homes became less affordable, fewer people bought homes in 2018. But home prices are still on the rise. When fewer people can afford homes, fewer people buy homes. The number of new homes sold in 2018 declined roughly ten percent compared to 2017, the steepest decline in seven years. There’s no need to panic; home prices still rose across the country, just at a slower pace than they did the year before. 2017 saw record increases in home sales and home prices. We’re seeing slower growth following the highest growth we’ve seen since 2008. Because we’re so used to seeing home prices rise rapidly, it’s easy to forget that the pillars of the economy are strong. Recently, there’s been a lot of speculation about a looming recession or a major crash like in 2008. 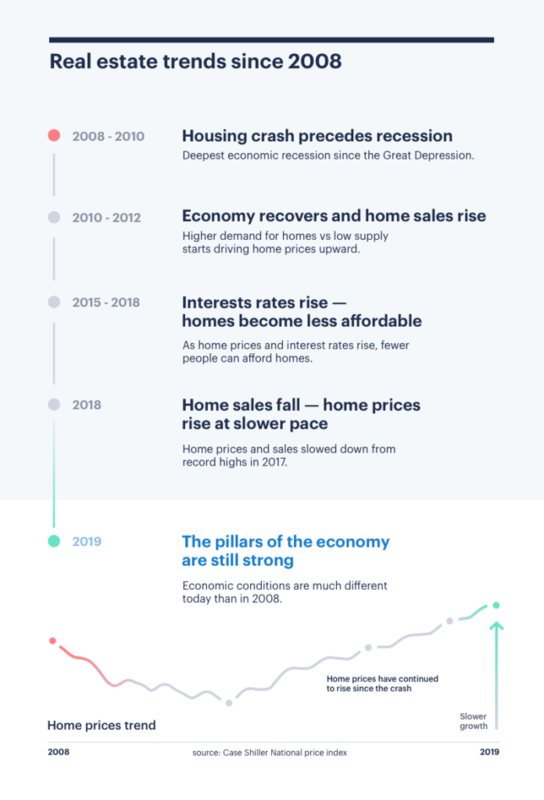 The economy and housing market look much different today than the period leading up to the Great Recession–slower growth doesn’t mean history will repeat itself. Rates may continue to rise and home prices may slow, but expect a soft landing. Buying or selling and want the digest? Jump ahead. The Subprime mortgage crisis led to a record decline in home values, about 30 percent (that’s a lot). This led to a record number of foreclosures, which contributed to the Great Recession. In real estate, we often use the term hard landing vs soft landing to describe how home prices are expected to fall. In a soft landing, prices gradually slow down, and in a hard landing prices fall rapidly. 2008 was the hardest of landings for home values. So why is 2019 different from 2008? What can we expect to happen? Consumers have stronger budgets. Banks too. Risky lending practices were a major contributor to the subprime mortgage crisis, and there are now tighter restrictions on lenders and banks. As a result, the number of people unable to pay their mortgages has been in steady decline. This is also because consumers have better finances. Household budgets are the strongest they’ve been in 40 years and a far-cry from 2008. According to Forbes, household budgets are remarkably healthy: income is growing, people are saving at a higher rate, and incomes are outpacing debts. 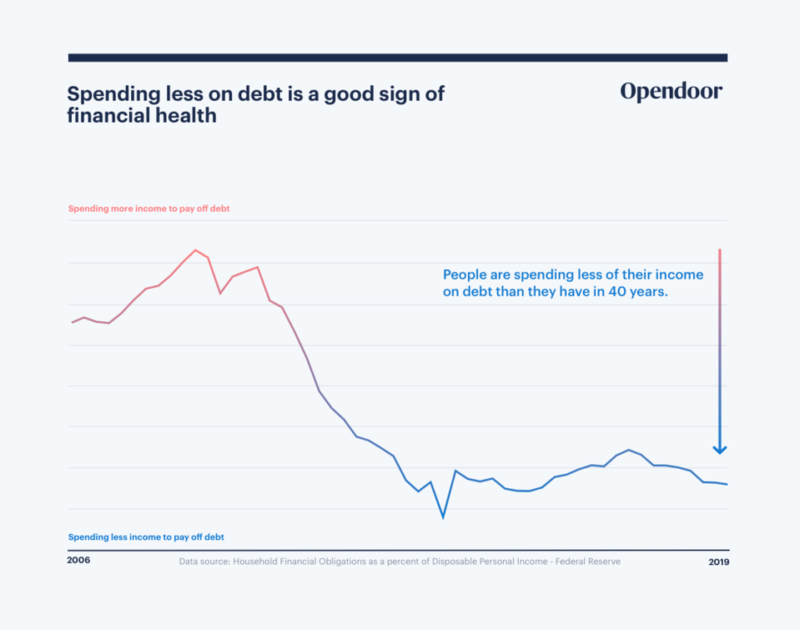 A good sign of financial health is spending less disposable income on repaying debts like a car payment, credit card, or student loans. Today, household budgets are the strongest they’ve been in 40 years and a far-cry from 2008. The fact that more people have room in their budgets to responsibly take on debt is good for housing demand. But remember, interest rates have been increasing, making it harder to afford a home. Because we’re looking healthy in 2019, rates may continue to go up. The current fed funds rate is projected to rise, and Freddie Mac expects mortgage rates to end the year at 4.9%. 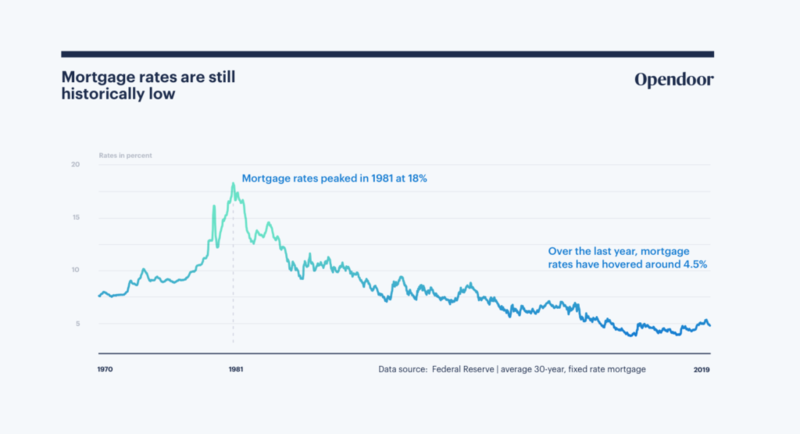 It’s important to keep in mind that even though mortgage rates increased in 2018, they are still historically low. Look at how they compare to the early 2000’s and how about the early 1980’s! But rate hikes aren’t written in stone. The Fed is constantly checking the health of the economy, and its attitude can change. Many were surprised when the Fed chose not to raise the fed funds rate at the beginning of the year, signaling that it was satisfied with the current pace of economic growth. It’s difficult to predict how the Fed will adjust rates, but what we can anticipate is the impact. Rising short-term rates means home buyers may have less money to spend. On top of that, the larger monthly payments that come with higher mortgage rates can make buying a home more challenging, especially for first-time homebuyers. Let’s look at what affordability looks like across the country. The map below shows the percentage of people in each area who can afford the median home price with the median income. The higher the percentage (in blue), the more affordable the market. The map ranks 237 cities based on their affordability. Click the button on the right to expand. In a nutshell: Home prices may slow in 2019 but expect a “soft landing”. The National Association of Realtors is expecting the median home price to increase roughly three percent in 2019. They also expect home sales to increase one percent year-over-year. In other words, slower growth but growth nonetheless. Slower growth in home prices isn’t always a bad thing; it can enable more people to enter the market. The Fed also wants the economy to grow at a steady pace to prevent a “hard landing” down the road. What matters most are the fundamental strengths of the economy like low unemployment, healthy consumer finances, and responsible lending practices. This is what keeps home prices stable as supply and demand fluctuate locally. What do today’s real estate trends mean for home sellers? More expensive markets may see less competition from buyers, but demand is still strong. The bidding wars and rapid price gains of previous years are slowing, but sellers can still expect strong demand. Demand is being driven by low supply across the country and more millennials buying homes. Realtor.com expects Millennials to be the largest segment of buyers this year, accounting for 45 percent of mortgages. Look at the average Days on Market (DOM) in your area to gauge the “temperature” of your market. A good way to understand if your market is “slowing” is to look at the average Days On Market—the amount of days a home is actively listed on the market. If similar homes in your neighborhood are taking longer to sell, that could signal lower demand. The longer your home sits on the market, the more time, effort, and costs you’ll endure. Use our selling cost calculator to estimate the total cost of selling and the money you’ll take home after the sale. In slower markets, sellers may need to be careful about how they price homes and which offers they accept. As rates rise, there can be higher demand for homes that are less expensive. Overpricing risks not finding a buyer or seeing longer Days on Market. If you’re pricing your home, consider using our home value tool to estimate your home’s market value. Keep in mind, the highest offer isn’t always the offer that’s most likely to make it to close. Our article on how to choose the best offer breaks down the process and how to make the right tradeoffs. We’ll make a competitive offer on your home so you can avoid listing, showings, and months of uncertainty. What do today’s real estate trends mean for home buyers? Buyers have more options, but don’t expect major discounts. The number of homes for sale ticked upwards in 2018, which is good news for buyers looking for more options and better value. However, the majority of that new inventory is priced at the mid-to-high end of the market, according to NAR. Buyers shouldn’t expect major price drops as home prices are still increasing in many cities, although at a slower rate. First-time home buyers may continue to struggle with affordability. While more first-time home buyers are entering the market, rising home prices and mortgage rates won’t make it easy. Check out our guide on determining how much home you can afford. If you’re just getting started, our checklist for first-time home buyers highlights how to prepare. Smaller cities are growing and creating more opportunity for buyers. As larger cities have become less affordable, it’s led to faster job growth in midsize and smaller cities, according to Forbes. Buyers feeling the pressure of high prices, may have more success expanding their search to smaller, yet faster-growing cities. A better way to find the right home. Buy a home from us directly or with your agent. You can also trade in your home so you can buy and sell at the same time. Anxious about the market? We can help. 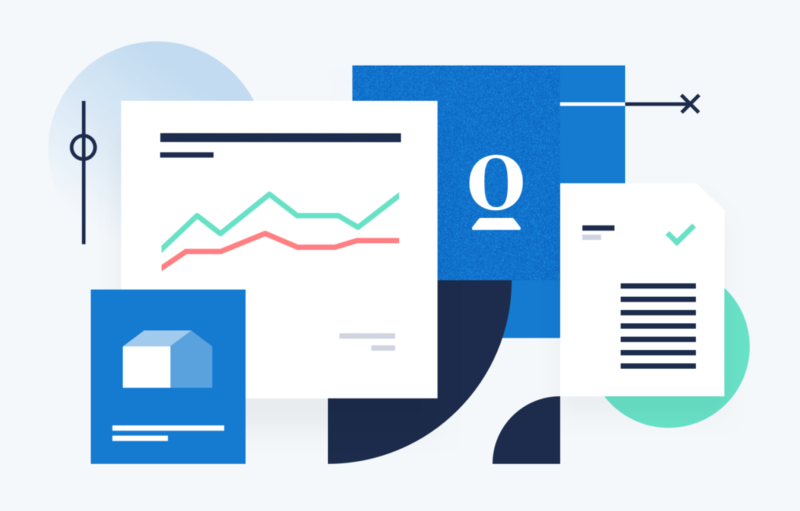 We created a new way to buy and sell a home that offers simplicity, certainty, and control, especially in slower markets. Opendoor is a full-service real estate company, and we’ve helped over 30,000 customers buy, sell, or trade-in their homes. Certainty in uncertain conditions for sellers. The longer your home sits on the market, the harder it can be to sell and the more housing overlap costs you incur, like storage fees, temporary housing, or a double mortgage. Sellers can receive a competitive offer from us in 24 hours and choose their close date, giving them control of the timeline. Learn more about our fees and how selling to us works. You can buy a home directly from us, with your agent, or we can refer you to a local expert. We also allow you to trade in your home. We’ll align your sale and purchase timelines so you don’t have to move twice (or into your in-law’s basement). We also have over 50 trade-in partnerships with the top national home builders. We’re constantly creating resources like this guide, so anyone—from first-time buyers to seasoned homeowners—can feel confident about real estate. Sign up for insights and tips. Special thanks to Lindsey Stein, Nicolas Solerieu, Jeffery Marino, and Nathan Wang. 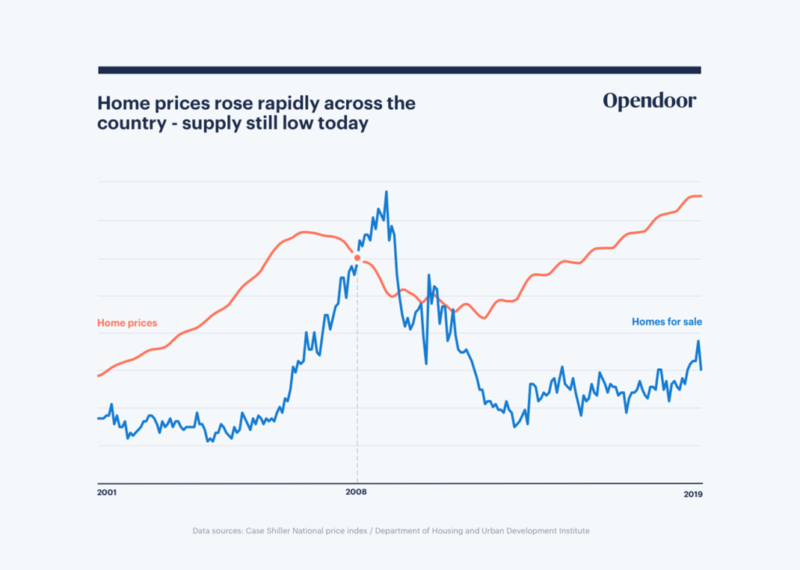 → How does Opendoor compare to traditional real estate? → What is an iBuyer? → How does Opendoor differ from other services like Zillow and Offerpad?